This delicious Egg Sandwich is so easy and so scrumptious. You can whip one together in just a few minutes and it tastes like heaven! Place one slice of white American on one side of the bread and place one slice of yellow American on opposite slice. Top each side with a thin piece of honey ham. Have all your bread assembled so as you remove the eggs from the pan you are ready to go. Cook one egg over easy per sandwich, Remove from the pan without over cooking and gently bring the sides of the sandwich together. DO NOT PRESS DOWN OR YOU WILL BREAK THE YOLK. Heat skillet over medium low heat. Top each sandwich with butter pats. Place butter side down in skillet. Cover loosely with aluminum foil Cook until bread is browned. Add pats of butter to uncooked side. 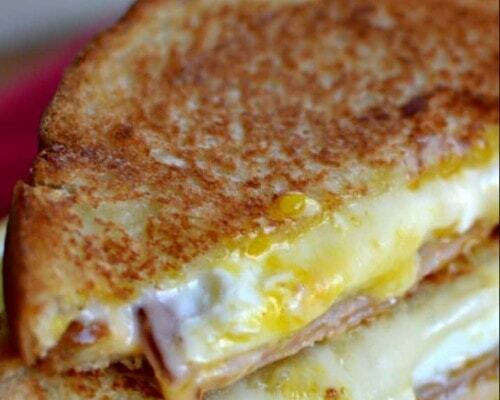 Flip and cook until sandwich is browned and cheese is gooey and melted.